All Level 3 Building Studies programmes have a two year duration. 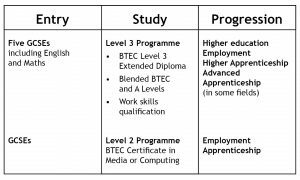 Students have the opportunity to select a combination of courses, that may include an academic A Level, dependent on the size of qualification and available time. This flexible approach is to enable students to access a broad range of disciplines within Building Studies, whilst gaining professional qualifications and authentic working experience. This will support progression into higher education and/or employment. Students are afforded a greater deal of independence and flexibility in their studies as their curriculum will be personalised to meet their goals. Learners can explore and focus in their preferred industry sector and begin to consider career options with potential employers, or undergraduate studies. We want our students to be work ready. That’s why we provide industry-recognised, professional qualifications alongside BTECs, so learners have the best chance of pursuing a career in Construction. Students are welcome to study Construction in our Sixth Form, at either Level 2 or Level 3 entry*. Level 3 entry offers a range of opportunities through an Extended Diploma or Diploma in either Construction and the Built Environment or Civil Engineering. This is two years of comprehensive theory and practical work, complete with professional technical qualifications and industry experience. Alongside, students can also complete optional STEM-related A Levels. Completion of our Level 3 Programme typically progresses onto undergraduate studies or employment. Level 2 entry provides a good introduction to the specialism. Students complete a Foundation Diploma in Construction and the Built Environment. Alongside this, students complete the required English and/or Maths GCSE retakes. *Sixth Form entry routes are dependent on GCSE results. More is explained in the tabs below. An Extended Diploma is designed to be studied over a two-year period, and is nationally recognised as a substantial qualification in any programme of study. Students will learn about a broad range of disciplines within the computing industry, whilst gaining professional qualifications and authentic working experience. 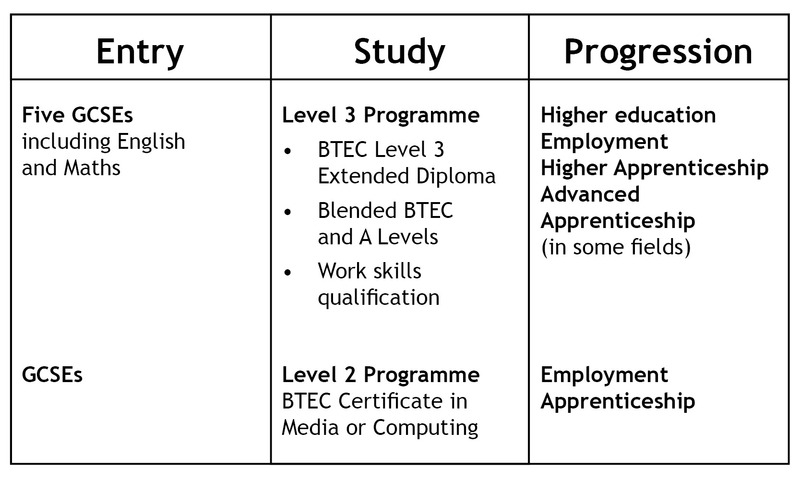 An Extended Diploma supports progression into higher education and/or employment. As part of our ongoing development, the UTC has been in discussions with the Insignis Multi Academy Trust (MAT) led by the Sir Henry Floyd Grammar School and we anticipate working more closely together from September 2018, to broaden the learning opportunities for students attending the UTC. Students can study a Foundation Diploma in Construction and the Built Environment (which is a Level 2 qualification). Maths and English GCSE retakes are available alongside. Level 2 Certificate in Work Skills. Completion of a Foundation Diploma supports progression onto Level 3 studies. Industry experience and professional qualifications come provided as part of the UTC learning experience.